THE CAR Is Coming To Blu-ray - Clips, Details & More Inside! Get ready to fasten your seat belts to experience the terrifying thrill ride that has become a cult classic THE CAR like never before as Scream Factory brings it to Blu-ray this month for the first time ever. We have for you today all of the details as well as Blu-ray clips and even the official trailer down below. THE CAR was directed by Elliot Silverstein and stars James Brolin, Kathleen Lloyd, John Marley, Elizabeth Thompson and Ronny Cox. R.G. Armstrong, Roy Jenson, Melody Thomas Scott, Kim Richards and Kyle Richards. THE CAR Blu-ray also contains a collectible cover featuring newly rendered retro-style artwork and a reversible cover wrap featuring original theatrical key art. "The peaceful tranquility of a small Western town is disturbed when a murderous car wreaks havoc by viciously mowing down innocent victims. The new sheriff, Wade Parent (James Brolin), may be the only one who can stop this menace in its tracks. But what Wade Parent doesn't realize is that the driver of this indestructible vehicle is far more dangerous than any man... because it is driven by pure evil." 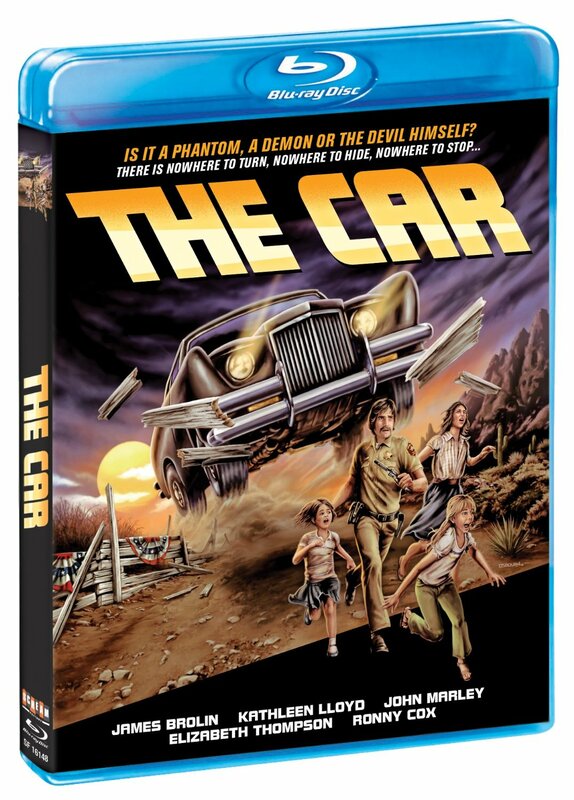 Scream Factory will release THE CAR onto Blu-ray December 15th.